There’s now two reasons I’d like to visit Cineworld, O2. To check out the huge Superscreen and also ScreenX. As suspected, ScreenX is also Screen 9. Overall I think ScreenX is quite effective at creating an immersive environment and will come into its own when more films are made with the technology in mind. It’s perfect for retrofitting into multiplexes where a PLF or IMAX screen of a worthwhile size would not be possible. It seems to be generating a good level of interest and my screening was surprisingly full for a Tuesday afternoon (yes it’s the school holidays but the majority of the audience was made up of adult couples and groups). I saw The Meg, and the sidewalls were generally used in action sequences with the more dialogue/story driven scenes using only the main screen. If you were to look straight at the sidewalls you’d see a stretched out, slightly pixellated image and notice the structure of the wall panels however that’s not how it’s meat to be viewed. The seating etc in the auditorium is unchanged from the recent refurb. Obviously gone are the bulges in the walls that previously concealed lighting and surround speakers (now relocated to just below the ceiling). Ventilation grilles are visible above the side projectors. I suspect the main screen has been replaced as it appeared slightly curved whereas the screens originally installed at the O2 are all flat, bar the Superscreen, which results in terrible hot-spotting on the 3D equipped screens not helped by the patchy silvering. ScreenX does seem to have a few drawbacks, most notably the effect of all the extra light in the auditorium. You’ve now got four extra projectors casting light across the ceiling even when projecting black, and the side walls which would previously have been a dark colour are now bouncing light around reducing contrast and black levels (which still managed to be acceptable, all things considered). It’s also obvious where the two projected sidewall images overlap, particularly in darker scenes. Finally it seemed as though there was a very slight lag between the main screen and the side projectors, noticeable in jump cuts and scenes with a lot of movement and I can see this causing motion sickness in some people if not corrected. I followed The Meg with another film in screen 1 and I’m pleased to say Cineworld have listened to complaints about lighting levels and fitted honeycomb baffles to the ceiling lights in screens 1-5. The lights still don’t dim as much as the improved lumieres fitted in screens 6-10 but the glare issue is eliminated. Elsewhere in the O2 the cinema extension’s structure appears to be almost finished and the outlet village that complete’s the loop is looking almost ready for fit-out. I’d imagine Hollywood Bowl and the bars and restaurants at what is currently a dead end can’t wait for the extra footfall this will bring as it’s a real ghost town down there when there’s nothing on in the arena. A week or so ago there was not a single cinema listed as having ScreenX in the UK on the Cineworld website, now there are two. Things change quickly! They seem to have made a mistake with their online ticket pricing for Students at Cineworld, Speke. The annual £4.95 subscription fee is supposed to save you 10% on ticket prices NOT charge you more, lol! The seats (Camatic Active Tilt Luxe) are the same as installed in all of the other conventional auditoriums at the O2, and also the same as the ones Cineworld trialled at a few sites as “Star Seating”. I guess this is one use where having splayed side walls is an advantage over the auditoria being rectangular shaped (side walls at 90 degrees to the screen)? Addendum to last post: If they’re using the Armstrong Tectum product mentioned in a linked interview I previously posted on the LSQ page, then based on Armstrong’s product literature then perhaps they are using pre-fabricated panels. Looking at a photo of the ScreenX auditorium, it looks like the sidewalls are indeed stretched fabric, as the “seams” between fabric sections (where the fabric meets the profiles to which it’s attached) are visible. The fabric sections also appear not to be entirely colour matched, either. LARGE_screen_format: The £35m figure is for the entire “Project Loop-Leisure and Cinema Extension” scheme, which also includes an indoor “trampoline park.” I assume Cineworld will be taking a lease on the space and their primary upfront capital cost will be for the fit-out. Thus there will be plenty of “immersive” seating positions, and it will be interesting to see if Atmos is installed also. Have yet to visit this cinema but hope to check out the massive Superscreen (largest in the UK?) at some point. With such a high footfall it’s not surprising Cineworld are investing a further £35M and extending this cinema which once finished will make it the largest multiplex in London. McLaren Group – Topping Out Ceremony on Project Loop at The O2 – July 2018. Plans for the extension are available in a planning application dated July 2016, within the “All drawings” document. 1073sq.m. (~11500sq.ft.) (!) of new foyer space (at “Level 02”) will be provided to the “right”* of the existing, via 6 steps due to a slight floor level change, from which (the screen end of) 5 new auditoria can be accessed. An additional “VIP” foyer, 365sq.m. (~3900sq.ft.) in floor area, will be provided off of this new foyer area, with stairs up to corridors at “Level 03” leading to 3 new auditoria situated above the new “Level 02” foyer areas. Note that whilst these drawings are marked as originating from CallisonRTKL, Chapman Taylor are the “fit-out and final delivery” architects. According to a press release from The O2, the cinema extension (50,000sq.ft.) is an anchor to within a 110,000sq.ft. development scheduled to open in Q1 2019. A new 4DX auditorium within the extension is also mentioned. LARGE_screen_format: Squaremeal – Cineworld O2 Greenwich. List of seating capacities for all existent (pre-extension) auditoria. Would not think it would be in the extension as the completion date isn’t until later this year, and IIRC from the plans (which for some reason I don’t seem to have provided a link to here, and I’m currently too tired to trawl around clunky local authority planning application databases!) the access to those auditoria will be via extended foyer/lobby areas. Tonight’s performance of The Meg at 21:15 is also already heavily booked. Was this a regular (non-4DX) auditoria? Can anyone confirm the seating capacity of screen 11, I have seen the following numbers quoted: 776, 785 and 850? ScreenX appears to be in screen 9 rather than being a completely new screen in the extension, if listings are anything to go by. They kept that quiet! I plan to check this out on Tuesday or Wednesday – the Tuesday screenings are looking very full already. Auditorium appears to have a similar layout to the existing ones. 14 rows with a total of 204 plus two wheelchair spaces. 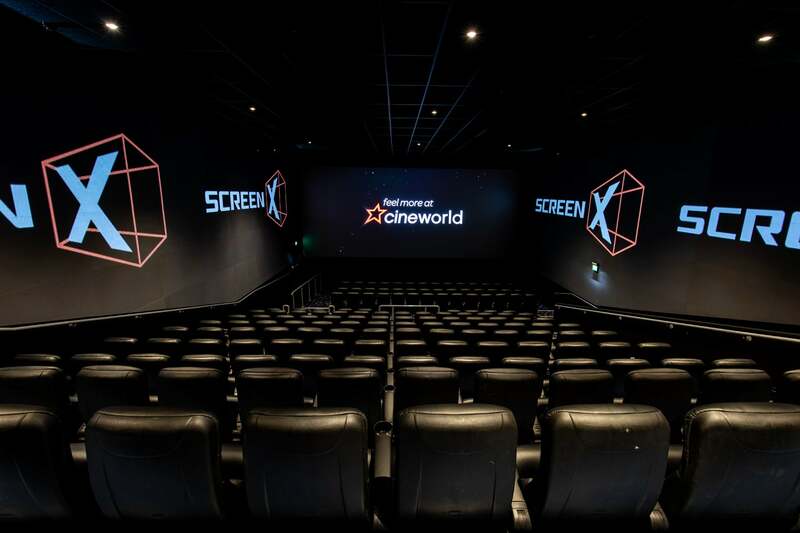 “We’re excited to announce that ScreenX has opened at Cineworld O2! Chapman Taylor’s industry-leading cinema expertise. Project page – Refurbishing, extending and equipping the largest cinema venue in London. Refurbishment of existing phase completed. They are involved with the fit-out of the 7 screen extension phase, with scheduled completion by the end of 2018. 4DX confirmed for extension, which will also include VIP screens. I’m slightly confused by the photo of the auditorium fitted with purple-coloured stretch fabric wall finishes, as it doesn’t seem to fit with Cineworld’s current house style? Zappomatic: Compared to the “commercial grade” RGBW LED strip I have*, I wouldn’t say it’s anywhere near as bright without a diffuser, even just turning one of the four LEDs in each chip on at full intensity. I think mine is somewhat brighter if I add a milky/opal diffuser. With a clear lens-type diffuser or no diffuser, it’s actually dazzlingly bright directly viewed, particularly at close proxmity, possibly even to a dangerous extent—given that theirs are installed on the columns/pillars, one can imagine, say, kids being “stupid”, so I’m not sure such intensity would be sensible in that application. OTOH, mine is concealed and angled towards a matt black finished wall (acoustic absorption), so I need as much output as possible! That said, even with a more modest output, as a narrow “linear” light source, the LED strips may well appear rather bright compared to a darkened cinema auditorium. Did you also find the “linear” LED mountings previously on the sidewalls/ceiling of the O2’s Superscreen excessively bright? Gosh the finish on that ceiling is very bad – certainly wasn’t noticeable before the LED displays were put in. Interesting that you didn’t find the pillar LED strips particularly bright as they seemed almost too bright when I saw them myself – perhaps they’ve reduced the intensity? I visited the O2 today, alas for the purpose of meeting someone, and not for the cinema. However, I did have a quick visit to Cineworld’s foyer. The “wrap around” of video LED modules is indeed active, and quite impressive. The LED strips on the columns didn’t seem very bright, and the colour wasn’t interesting either, albeit they are probably using “milky” diffusers, which result in significant light loss. The vertical LED strips either side of the main entrance escalators appear to be “addressable,” sometimes showing “rainbow” effects, other times just a linear strip of the same colour. Floor tiles appear to be good quality, but the painted wall finishes I looked at were very poor indeed. It’s painfully obvious with the ceiling where the new video LED modules are bright enough to reveal the defects. The gloss perspex/acrylic ceiling strips seem to be just stuck on to the ceiling with no backlighting to be added. Perspex is fairly expensive stuff (at least priced per sq. m.) and it can yield fantastic results, with many options including sparkle/metallic/pearlescent variants; I can’t help but think that this isn’t the way to use it to best effect. The foyer looks good in photos, but in my view, more attention to detail is needed. Above all, given the expense of the video LED modules, it seems very odd that the walls aren’t even remotely smooth. Sofas looked reasonable, but I forgot to try them out! Photos uploaded: Foyer/new video LED modules “wrap around” display, close up of poorly finished foyer wall (including dent! ), main entrance escalators/stairs with “rainbow” LED strips. According to a friend the LED displays in the foyer are now active and the effect is very striking, and the Supercreen’s hula hoops have been taken down. The endless tinkering here is quite amusing although hardly professional. Added a photo showing the shiny bits on the foyer ceiling. As predicted a whole load of black and red sofas have been added. Unfortunately screens 1-5 still have glaring lights but mercifully it looks like a lot of the individual LEDs in the luminaries are dying a premature death. Regarding the blue/cyan lighting, it can appear a different colour in different photos. The lighting on the foyer pillars is definitely more cyan, whereas I’d say the panels in the corridor are somewhere between cyan and blue. I was sceptical of this refurb at first as it felt cold and clinical (especially with the removal of the bar area) and the new lighting in the screens was ridiculous, but as they’ve sorted that out and the foyer work comes together it feels fresh and modern. It’s odd that there’s nowhere to sit in the main foyer (upstairs there are tables and chairs) but I wouldn’t be surprised if we see some deceptively hard pleather sofas appear once all the work to the ceilings and the digital displays is finished. An unfortunate side effect of all these bright lighting features is that when you come out of a screen you have to walk through a red-lit door surround which after the darkness of the auditorium is overwhelmingly, almost painfully bright. Coming out of the Superscreen the blue-edged pillars leave an impression on your retinas! I’m looking forward to seeing how well the extension integrates with the rest of the cinema. The plans don’t give much away about the foyer but there appears to be lots of floor space. Given the VIP screens will have their own bar I’d be surprised if we don’t see a bar for the main screens too as the old one seemed to do a steady trade. I guess a Starbucks is a possibility but there’s already an outlet at the O2.